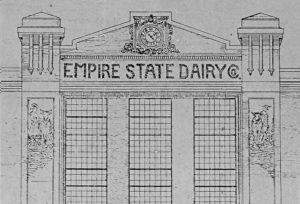 The Empire State Dairy just received landmark status. Located in East New York, the factory was built in 1914 for the Borden Dairy Factory. The property holds five buildings on a 76,375 square foot area. 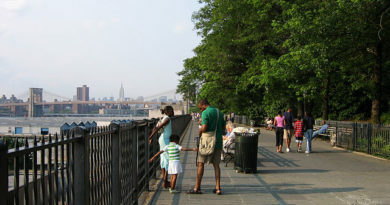 Later the company changed to the Empire State Dairy producing milk and ice cream. Historian and tile collector Michael Padwee has been struggling to save the buildings since the 1990s. Of particular interest to Padwee are two beautiful vertical tile murals on the façade of the main building which were commissioned especially for the Empire State Dairy building. The murals were made under the direction of Leon Solon, art director of the American Encaustic Tiling Company, an Ohio-based firm once the largest tile producer in the world. The two tile murals are “probably the largest murals by this company that are still existing,” says Padwee. The buildings have not operated as a dairy since the 1950s. Since the city has been addressing the decline and neglect of the neighborhood in more recent years, government officials have rezoned the area to encourage economic growth, long-term development and an increase affordable housing. In April 2016 the East New York rezoning plan was passed, putting the Empire State Dairy, located at 2840 Atlantic Avenue, at risk for destruction, or significant changes if it was not protected as an historic landmark. Other historic buildings in the area are at risk, but now that the Empire Dairy has gained its landmark status, it and its unique tile murals will be preserved.